Visits by Xangans have been frequent this winter. Last month, David (fongster8) was in town for a few days and Tawn and I had a chance to enjoy a few meals together with him. 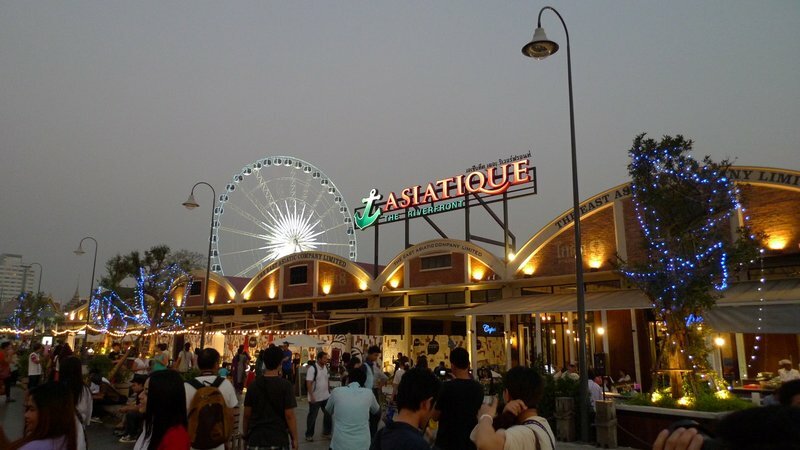 One evening, we took the boat down river to Asiatique, a shopping and entertainment center built on the site of the former East Asiatic Company’s old godowns. The complex opened less than a year ago and is, to some extent, a rebirth of the Lumpini Night Bazaar, which was torn down to make way for another mall. The waterfront complex looks like a series of warehouses and offers a nice promenade along the river from which to catch a breeze and watch the sun set. The free shuttle boats run from the Taksin pier (near the BTS Saphan Taksin station) every fifteen minutes, making a convenient and enjoyable way to arrive at the shopping complex. I had to laugh at this sign (and ignore the “no photography” sign) that lost the word “beware” or “watch out” when translated to English. 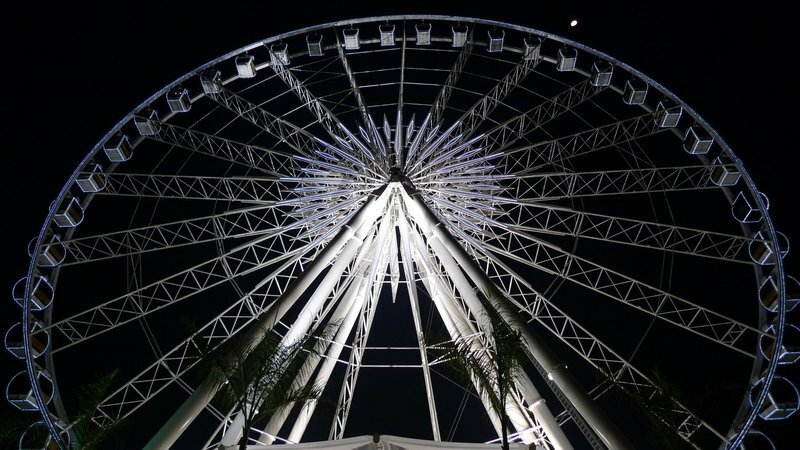 The most recent addition to Asiatique is a giant ferris wheel, not so large as the London Eye or Singapore Flyer, but a landmark in its own right. I mockingly called it the Bangkok Eye and a friend commented that the name sounded like something you might catch in the sketchy Patpong nightlife district. The brightly lit wheel is located adjacent to a large temple complex and I can only imagine that the monks next door are forced to endure both noise and visual pollution. The shopping isn’t much, mostly nick-knacks of the tourist variety but there is enough to entertain you for an hour or so of browsing. The restaurant selection is wide, from an inexpensive food court to expensive restaurants of all stripes. There are nice public spaces, too, and the architecture is pleasing, albeit in a Disneyesque way. As for David, his visit coincided with his birthday. He said he didn’t want to make a fuss over it, but I find that people who don’t want to make a fuss over their birthday usually don’t bother mentioning that it is their birthday. 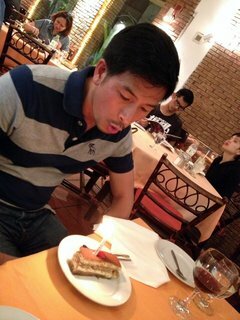 Tawn and I took David out for a nice Italian meal, complete with a birthday tiramisu and candle. Thanks for visiting again and happy birthday! 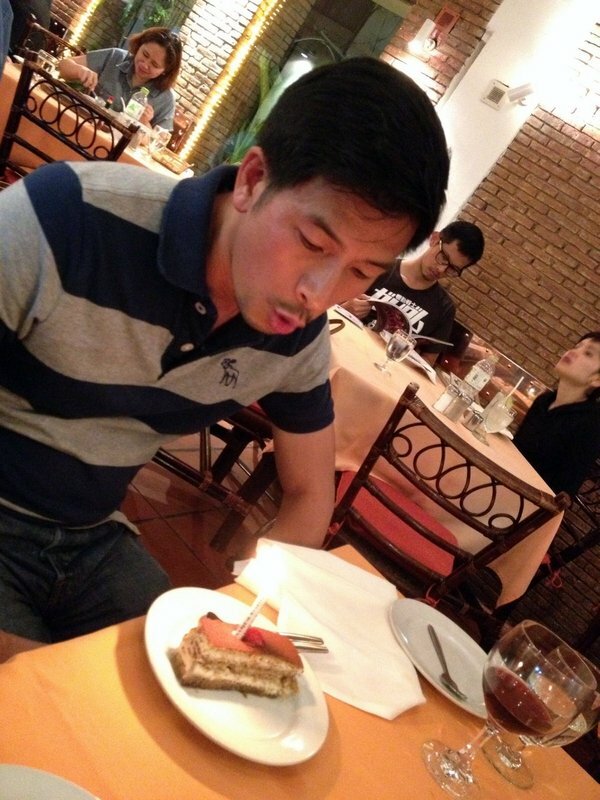 This entry was posted in Uncategorized and tagged asiatique, fongster8, riverside, shopping by christao408. Bookmark the permalink. Aww… I like these gestures and nice touches you guys do for your friends. I was telling Td I want to go on that ferris wheel and he just shuddered and said the view would be amazing but the height would do him in<:)This looks like a great place to have an adventure and love the photos. TY for sharing your adventure. ” A rebirth of the Lumpini night market”, that sounds quite good! I remember the old spot has a big outdoor stage and beer bars, and souvenir stalls. You have to become the Ambassadors for visiting Xangans – nice job!!!!! Thanks again for meeting up with me and thanks for the tiramisu! I love the photo of the ferris wheel! Perhaps a new career as a tour guide?! @rudyhou – Oh, I thought we would all be in Hong Kong around then. 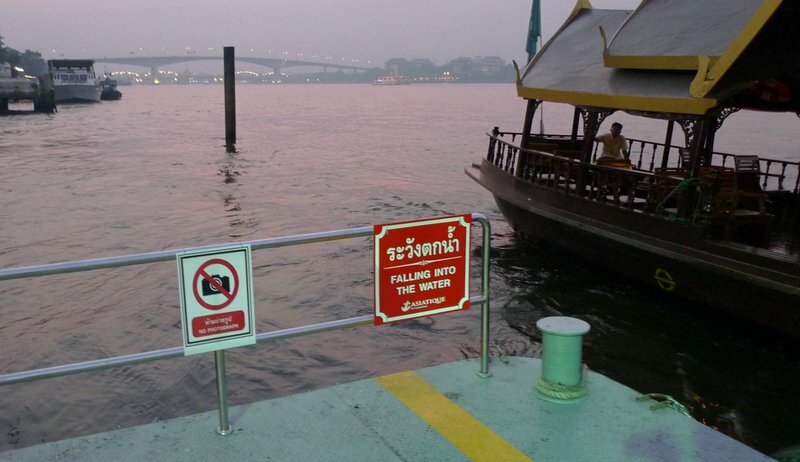 But Bangkok would be fun, too. @Fongster8 – Oh, would love to introduce you, then. @Inciteful – Yeah, yeah… “no big deal” – I’ve heard that before! @murisopsis – You know, I’ve thought about it. Technically, it is a protected profession that non-Thais are prohibited from, but I think it could be a very fun thing to do. Exhausting, though, especially if you cannot vet your clients enough to know if they are really adventurous. That would be great! PS, Jonathan and I might join Marcel in April although we wouldn’t spending as long as him in Thailand! @Devilzgaysianboi – I bet. Well, next time I’m back in the Bay Area, we’ll have to meet there. @Wangium – Just checked and am surprised that I don’t have that date written on my calendar. @Fongster8 – You are always welcome back.